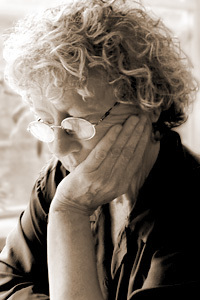 Jean Valentine is the author of numerous collections of poetry, including Break the Glass (Copper Canyon, 2010), Little Boat (Wesleyan University Press, 2007), Door in the Mountain: New and Collected Poems 1965–2003 (Wesleyan, 2004, recipient of the National Book Award for Poetry), and Dream Barker (Yale University Press, 1965, recipient of the Yale Younger Poets Award). Her chapbook Lucy is available from Sarabande Books as part of the Quarternote Chapbook Series. Valentine is the recipient of fellowships and awards from the John Simon Guggenheim Foundation, the National Endowment for the Arts, the Bunting Institute, the Rockefeller Foundation, the New York State Council on the Arts, and the New York Foundation for the Arts, as well as the Maurice English Prize, the Teasdale Poetry Prize, and the Poetry Society of America’s Shelley Memorial Prize. She has taught at Sarah Lawrence College, the Graduate Writing Program of New York University, Columbia University, and the 92nd Street Y in Manhattan.